Payday loans have been a hot topic in the media lately—John Oliver did a great segment as well as NPR, Washington Post, and others. Most exposés uncover the problematic economics and politics behind the industry, but they don’t actually take us into the bank-like stores so we can feel the highs and lows that come with trading the future for short-term stopgaps. Two characters in my novel have very distinct experiences with predatory lending, and I wanted to walk in their shoes, so I set out to find some cash. You don’t have to seek out a payday loan store, just drive for a minute on any major street not in Beverly Hills and you’ll pass a few bright green signs claiming, “Get Cash Now,” “Cash for Checks,” and “Immediate $$$.” There are actually more payday lenders in the US than McDonald’s. I found one that looked the most inviting and served up the loans with a side of bill paying and cellphone “top-ups,” which I soon discovered add minutes to cell phone plans running low. The store opened at 10:00am and I arrived at 10:02am; there was already a line of five people ahead of me. The first customer was a woman who spoke as quietly as possible, while still allowing her excuses to penetrate the thick glass partition protecting the cashier. The rest of us in the 15 x 8 box could easily hear her explain that she worked at the Vons down the street and only needed the money because her mother had a medical emergency. When it was my turn, I understood the impulse to explain why I needed the money, but instead simply said I wanted $50. The cashier’s responses were short and dull. A form slid through the opening in the protective glass, but I had still some questions. “It’s on the wall.” She pointed to a poster that had the APR for 14 days and 30 days listed. I slunk over to a small circular table in the corner. The form was one page, with basic information; however, one section caught me off guard. It asked for personal references and my employer’s contact information. If they called my work to check-in on me, it wouldn’t exactly speak to my stability. So, I walked to the side of the booth and made the, “I have a quick question,” gesture. NO IT ISN’T. The poster simply explains that they would hand me $42.50 in cash, and I would pay them $50 in 14 or 30 days. It did not list the fees and penalties associated with late payment. I later used a calculator and research on compounding interest to figure out that a 460.08% APR means I would owe $280.40 in a year (this still isn’t exactly how the interest is calculated since they have late fees that also pile on each month). Now, just imagine taking out a $1000 loan ... You’d owe $5,600. Amidst the oversimplified posters, lack of information, abrasive employees, and desperate need of finances, I’m not sure how anyone could understand the long-term impact of signing the form. I walked out of the store with my $42.50 and the drained, dismal feeling you get after a long argument that nobody wins. Still, I realized my fortunate luxury in actually having the means to pay the loan back. But, I didn’t do it. Returning the money felt like ending an experiment before the beaker even started to boil. The American dream is becoming more financed by debt. American consumers owe 11.85 trillion dollars. The size of this figure is best illustrated by the amount of numerals it takes to write out what we owe: $11,850,000,000,000. So, in a completely unscientific way, I’ve decided to take my $42.50 and try to leverage the debt to make money over the next three days. How is TBD, but I will post another story with the results. 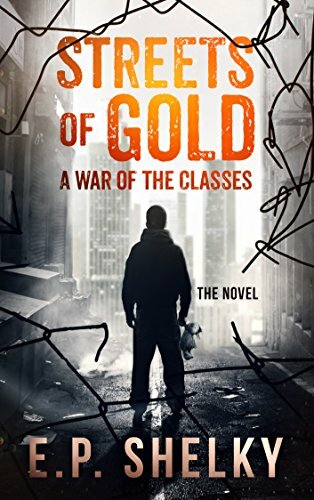 Streets of Gold is available for pre-sale now. Reserve your copy on Amazon.